On their sophomore effort Declaration of War, in some sense, Sweden's Mean Streak progresses in their heavy metal. New guitarists Patrik Gardberg (Solution 45, Ammotrack, Divinefire) and David Andersson (Soilwork, Bj�rn Strid) have been added for a more intense twin guitar attack. Conversely, for some listeners, Declaration of War may have the intensity of 2008's Metal Slave, but not always the hooks. Delivering a traditional form of metal (melodic, heavy, speed, and thrash by example) circa 1983, Mean Streak probably has many, and adequate, peers in the rebirth of old school metal. Declaration of War is heavier than it's predecessor, but not always that accessible. Vocalist Andy La Guerin is strong but seems conflicted, sounding like a mixture of Tobias Sammet and Udo. Nevertheless, Mr. La Guerin is a genuine metal singer. As for the songs, repeated listens are needed and will eventually convince of what you already knew: Mean Streak delivers classic heavy metal. Crimson Sky, Brothers Til the End, and History of Lies are convincing evidence. By the time you get to the closer The Oblation you're convinced that Mean Streak is at the top of their game. With the song composition, vocal arrangements, and twin guitar attack, Mean Streak's Declaration of War solidifies their interpretation of classic and traditional melodic heavy metal, and satisfies those who love the same. If much of the preceding seems to project or impose upon the reader somes sense of ambivalence, I apologize. Declaration of War is certainly recommended. 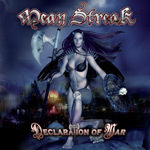 With the song composition, vocal arrangements, and twin guitar attack, Mean Streak's Declaration of War solidifies their interpretation of classic and traditional melodic heavy metal, and satisfies those who love the same.